Shawnee Superintendent James Kanable, speaking before the Shawnee Optimist Club explains the need for passage of a tax levy in November. 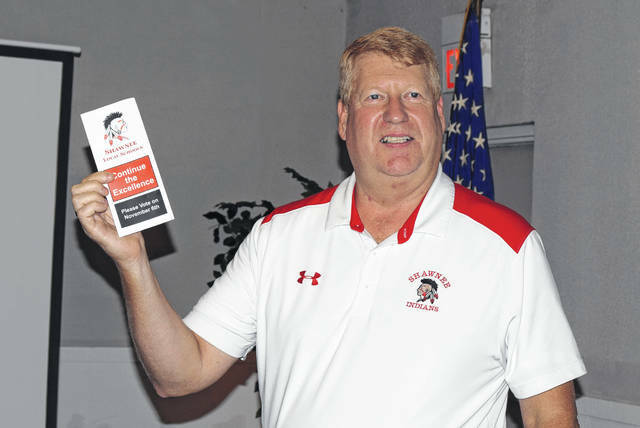 SHAWNEE TOWNSHIP — The superintendent of Shawnee Schools spoke before the Shawnee Optimist Club Wednesday to talk about the need to pass an upcoming tax levy in November. Voters will consider a 4.48-mill levy and the renewal of a 4.113-mill levy. “The 4.48, it is a specific dollar amount that we ask for, and that’s $1.95 million, and the renewal, I’m not sure the dollar amount right now. It’s probably about $1.5 million dollars,” said Superintendent James Kanable. The need for the new tax money and the renewal is something that’s been brewing for a few years. “This is an ongoing need. This goes back to 2009 when the tax structure in Ohio changed from personal tangible property incorporating a CAT [Commercial Activity] tax at that point. The personal tangible property used to go through local funds and the local county treasurer. The auditor would take care of disbursing this to districts. Now everything goes through the state, and what we get back from the state is very minimal to what we used to get with that type of tax,” said Kanable. With around two months to go before the election, it’s important for Kanable to get the message out now. “With early voting that’s taking place in our state in the last four or five years, it becomes very evident that many people are taking advantage of that, so having our message out there understood and questions being asked and answered prior to Oct. 7th is very important to us right now,” he said. “It comes down to an explanation of how that tax structure impacted us and why it took so long to get to the need today, and the fact we’re asking for a smaller amount now and trying to be proactive instead of reactive to a much more difficult situation that can be right around the corner if you don’t pass this,” he said. So what could happen if this doesn’t pass in November? “Well, we go back to the drawing board with the board [of education]. We’re not trying to twist anybody’s arm. We’re not trying to, I guess, holding anything over anybody’s head. We are not cutting programs. We are not doing anything at this time. However, as those reserve funds get shorter and dwindle more, some tougher choices may be ahead of us, and we wanted to give the community the opportunity to weigh in on our situation prior to ever getting to that,” he added. https://www.limaohio.com/wp-content/uploads/sites/54/2018/09/web1_SHAWNEE-LEVY-TONED-1.jpgShawnee Superintendent James Kanable, speaking before the Shawnee Optimist Club explains the need for passage of a tax levy in November.